Community TV broadcasters Perth’s Access 31, Sydney’s Television Sydney, Channel 31 in Melbourne, Brisbane and Adelaide have joined forces to create the Australian Community Television Alliance. ACTA has formed to put further pressure on the federal government to switch the sector from analogue to digital transmission. It follows disappointing attention by the previous Howard Government, including being left out of funding in federal budgets. ACTA will lobby communications minister Stephen Conroy for a conversion plan to bring the community channels in line with the rest of the TV industry. Its president Andrew Brine, who also runs Perth community TV station Access 31, said the sector faced an uncertain future with the federal government yet to reveal its conversion plans. “The former government made vague promises, but never really presented a formal proposition whereby we could make the necessary switch to digital,” Mr Brine told The Australian. ACTA will also work with community TV licensees to foster the development of new programs and initiatives and increase awareness of the existence of the sixth free-to-air channel, Mr Brine said. A number of shows and stars have started out on community television including Blokesworld, Vasili and of course Gold Logie winner Rove McManus. 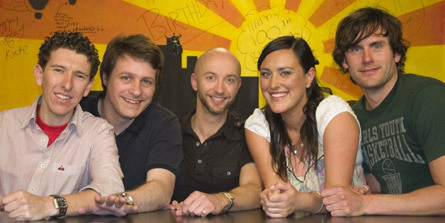 Photo: The Breakfast Show, C31 Melbourne.